I don’t cook – I order. It’s not that I can’t cook, mind you. I simply choose not to. My poor husband has lived off of pre-made meals and take-out for the past five years, ever since my youngest child went off to college. I am sure out of sheer desperation, he moved me to Africa so he would get a home-cooked meal. Smart move, fella! Clearly it has paid off. Since landing in Luanda about three and a half weeks ago, I have cooked more meals that I have in the past five years! Sadly, this is not an exaggeration. Yes, the tide has definitely turned. 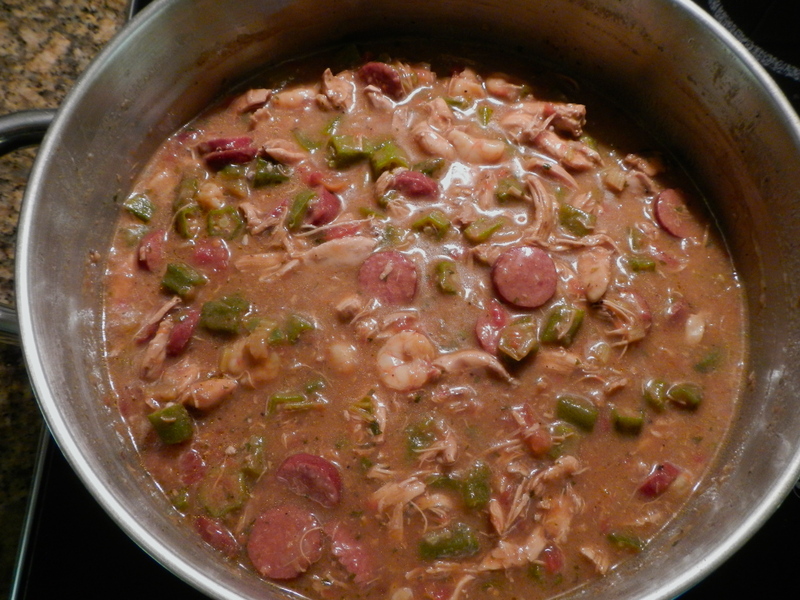 Right now, I have a huge pot of delicious chicken, shrimp and sausage gumbo bubbling away on my stove. 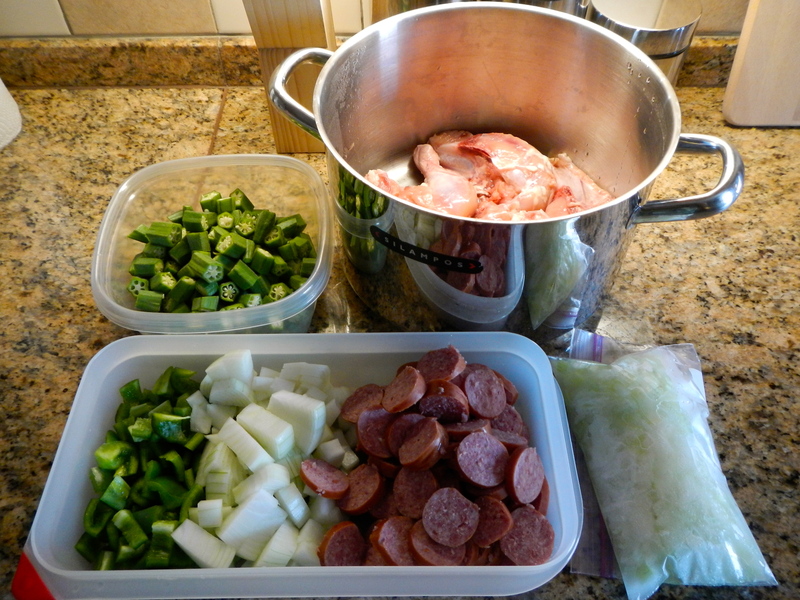 The last – and only – time I made gumbo, it was 1988 and Hubby and I were newlyweds living in Anchorage, Alaska. One of our favorite couples was moving to Lafayette, Louisiana and we were hosting a large going away party for them. Just like in Texas, everything is bigger in Alaska, and so this meant we were expecting about sixty people for dinner. Clearly, I have a tendency to bite off more than I can chew. “I’ll make gumbo!” I declared to one of my friends, who was helping me plan the dinner. “Are you sure? Have you ever made it before?” she asked, a bit too quickly. “How hard can it be?” I said, “It’s just a big pot of soup, basically.” Foolishly, I was not a bit worried about cooking for sixty people. Even more foolishly, I was not worried about cooking Cajun food for real Cajuns. Many of our guest were from Louisiana, and had eaten their share of world-class gumbo. Word soon spread that a Texan, and a first-timer at that, was attempting to make this delicate and time-honored dish. The morning of the party, a very large woman, whom I had never seen before, showed up unannounced at my door. “I’m here to make the roux,” she said, brushing past me to head to my kitchen. Dumbstruck, I followed meekly behind her and watched in amazement as she proceeded to work my kitchen like she owned it. This gal knew a thing or two about Cajun cooking. And, by her sheer size, I guessed she knew a thing or two about eating it, too. She stood at my stove and stirred the roux for a full 30 minutes, saying little. She was there to do a job, not make small talk. Finally, after what seemed like an eternity, the roux had reached a lovely golden brown – the color of a brown paper bag, by her description. Her job was done. She had saved the roux from certain ruination, and all was right with the Cajun world. I have to admit, it was a good thing she showed up. I would have given the roux about five good stirs and then moved on – or worse, gotten distracted and let it burn. Quelle horreur! That would have been a disaster of Hurricane Ike proportions! 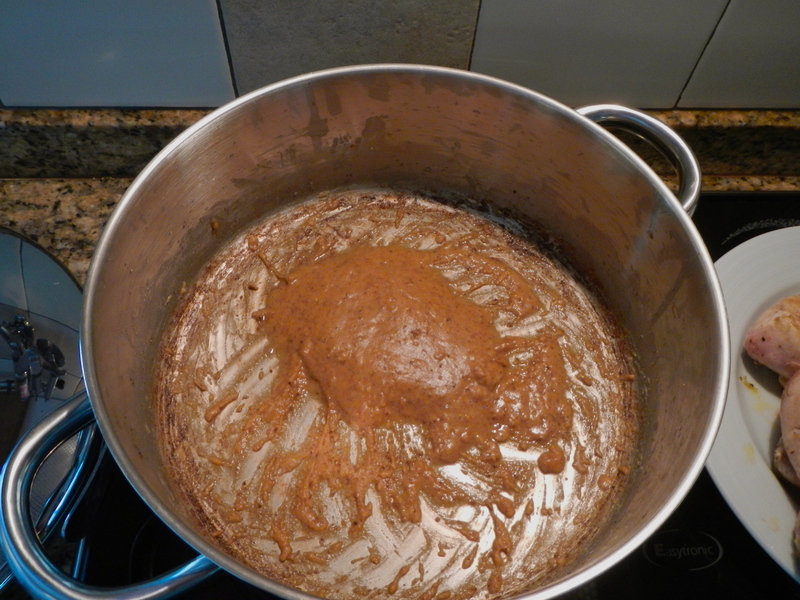 I’m happy to report, both the party and the gumbo were a big success, but I have never attempted to cook a roux again. The idea of another stranger showing up at my door was enough to put me off the idea. Last week, on one of my marathon hunting/gathering sessions to multiple grocery stores, I found some Hillshire Farms smoked sausage – and did a little jig in the aisle when I did. Finding American products here in Luanda is like finding gold! And today, I came across some gorgeous okra at another store. The seed was planted. I decided to give gumbo another try – but only after bolting my door and drawing the curtains closed. The basic ingredients – not always easy to find here in Luanda, especially the sausage. My roux after stirring it for thirty minutes over low heat. Cher, let me tell you, it was worth the wait! Coo-Wee, this dang gumbo is so good, I think I will call it yum-bo! Paul Prudhomme would be proud! Bon Appetite!